I’m a full service luxury event and portrait photographer specializing in custom photography for both commercial and private use. 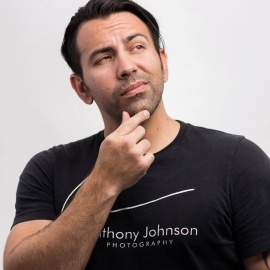 Majority of my work can be found on my site: www.AnthonyJohnsonPhotography.com Did I mention I am also a member of the Professional Photographers of America (PPA)? What does that mean, it means you will get the highest quality of professionalism and imagery in the industry. Friendly Staff, expert at what they do, in and out no hassle! Join us at POP as we host another fun and exciting watch party. pretty cool spot in the Domain to grab a drink and visit friends. Pros: staff is friendly, Sunny is the nicest girl I know up there. I prefer to take an extra wait time just so she can serve me! Bring in the New Year with style at The Nook on 6th Street. BLACK & WHITE or Semi-Formal Casino attire! Celebrate Day of the Dead with us. Hold those glasses high and cheers to spirits of the past. Mingle with international Formula 1™ enthusiasts for an evening of Style in the Fast Lane. First time i went in I wasn't sure what I was getting myself into. After checking out this place I have to admit I am glad I went here. My overall experience was great. You get in line as if you are at subway, you pick what size of pizza you want then you basically "build your own pizza". I picked a medium size and no matter how many items I picked to be placed on my pizza, the price stayed the same. Naturally I loaded up my pizza- haha! After I built my pizza, they tossed it in the oven, i paid for my food and when the pizza was done heating up they called my name. The pizza was yummy just as I had imagined it would be. 5 out 5 stars! Cons: I can only could eat so much before i got full. Formula 1 United States Grand Prix: International drivers will be in Austin this October to compete in the Formula 1 United States Grand Prix at the Circuit of The Americas track. The Austin Revolution Film Festival is back for the 2016, our fifth year offereing a venue for true indies in Austin, Texas! Check back here for more information as we get closer to the dates. This Friday at Pop we have DJ Vegas Banger in the house with DJ Reckshop opening up for him! It's going to be a wild one! Get your table reservations now!